Mudskippers are a type of fish. They are part of a fish family known as the gobies. They are amphibious fish: they can use their pectoral fins to "walk" on land. They are adapted to intertidal habitats. These are places where the tide of the ocean comes in and out. Most fish that live in these habitats hide under wet seaweed or in tidal pools to stay moist or wet when the tide goes out. Mudskippers are active when they are out of the water. They eat and interact with each other. They defend their territories. Mudskippers are found in places that are tropical, subtropical and temperate. They live near the shores of in the Indo-Pacific and the Atlantic coast of Africa. 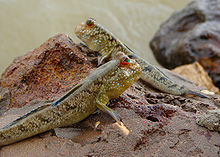 Periophthalmus gracilis, a type of mudskipper. It lives anywhere from Malaysia to North Australia. Anatomical (body) and behavioral adaptations let them move better on land and water. These fish use their fins to move around in skips. 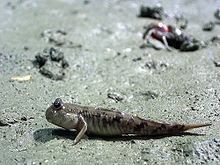 This gives them their name, "mudskipper". They can also flip their strong body to jump up to 2 feet (60 cm) into the air. Mudskippers can breathe through their skin and the lining of their mouth (the mucosa) and throat (the pharynx). They can only do this when they are wet. This means mudskippers can only live in humid places. This way of breathing is like how amphibians breathe. It is known as cutaneous air breathing. Another important adaptation that helps breathing while out of the water are their enlarged gill chambers. They keep a bubble of air there. These large gill chambers close tightly when the fish is above water. This keeps the gills moist and lets them to function. They act like a scuba diver's cylinders. They give oxygen for breathing also while on land. They dig deep burrows in soft sediment, or the bottom of an ocean or lake. This lets the fish thermoregulate, or keep its body temperature the same. They can also avoid ocean predators during the high tide when they burrow underwater. They also lay their eggs in these burrows. Even when their burrow is underwater, mudskippers have an air pocket inside it. This lets them to breathe where there is little oxygen in the water. The genus (a group of closely related species) Periophthalmus is by far the most diverse and widespread group of mudskipper. There are eighteen different types. Periophthalmus argentilineatus is one of the most widespread and well known species. It can be found in mangrove ecosystems and mudflats of East Africa and Madagascar east through the Sundarbans of Bengal, South East Asia to northern Australia, southeast China and southern Japan, up to Samoa and Tonga Islands. It grows to a length of about 9.5 cm and is a carnivorous opportunist feeder, which means it will eat anything it comes upon. It feeds on small prey such as small crabs and other arthropods. Another species, Periophthalmus barbarus, is the only goby that lives in the coastal areas of western Africa. ↑ 1.0 1.1 1.2 Murdy E.O. (1989). "A Taxonomic Revision and Cladistic Analysis of the Oxudercine Gobies (Gobiidae: Oxudercinae)". Records of the Australian Museum Suppl. N°11: 1–93. ↑ Swanson, B.O, and Gibb A.C. Kinematics of aquatic and terrestrial escape responses in mudskippers. The Journal of Experimental Biology. Vol. 207, 4037-4044. October 21, 2004. Accessed 2009-05-25. ↑ 3.0 3.1 Harris, V.A. (1960). "On the locomotion of the mudskipper Periophthalmus koelreuteri (Pallas): Gobiidae". Proceedings of the Zoological Society of London 134: 107–135. ↑ Piper, Ross 2007. Extraordinary Animals: An Encyclopedia of Curious and Unusual Animals. Greenwood Press. ↑ Tytler P. & Vaughan T. (1983). "Thermal Ecology of the Mudskippers Periophthalmus koelreuteri (Pallas) and Boleophthalmus boddaerti (Pallas), of Kuwait Bay". Journal of Fish Biology 23 (3): 327–337. doi:10.1111/j.1095-8649.1983.tb02912.x. ↑ Sasekumar A. et al (1994). "Proceedings, Third ASEAN-Australia Symposium on Living Coastal Resources. Research papers". Sudara S; Wilkinson C.R. & Chou L.M. (eds) : Vol. 2: 457-464Bangkok, Thailand: Chulalonghorn University. ↑ Brillet C. (1969). "Etude du comportement constructeur des poissons amphibies Periophthalmidae". Terre et la Vie 23 (4): 496–520. ↑ Ishimatsu A., Hishida Y., Takita T., Kanda T., Oikawa S., Takeda T. & Khoo K.H. (1998). "Mudskipper Store Air in Their Burrows". Nature 391: 237–238. doi:10.1038/34560. ↑ Ishimatsu A., Takeda T., Kanda T., Oikawa S. & Khoo K.H. (2000). "Burrow environment of mudskippers in Malaysia". Journal of Bioscience 11 (1,2): 17–28. ↑ Lee H.J., Martinez C.A., Hertzberg K.J., Hamilton A.L. & Graham J.B. (2005). "Burrow air phase maintenance and respiration by the mudskipper Scartelaos histophorus (Gobiidae: Oxudercinae)". The Journal of Experimental Biology 208: 169–177. doi:10.1242/jeb.01361. ↑ Larson H.K. & Takita T. (2004). "Two new species of Periophthalmus (Teleostei: Gobiidae: Oxudercinae) from northern Australia, and a re-diagnosis of Periophthalmus novaeguineaensis". The Beagle, Records of the Museums and Art Galleries of the Northern Territory 20: 175–185. ↑ Jaafar Z., Perrig M. & Chou L.M. (2009). "Periophthalmus variabilis (Teleostei: Gobiidae: Oxudercinae), a valid species of mudskipper, and a re-diagnosis of Periophthalmus novemradiatus". Zoological Science 26: 309–314. ↑ Jaafar Z. & Larson H.L. (2008). "A new species of mudskipper, Periophthalmus takita (Teleostei: Gobiidae: Oxudercinae), from Australia, with a key to the genus". Zoological Science 25: 946–952. ↑ Milward, N. E. (1974). Studies on the taxonomy, ecology and physiology of Queensland mudskippers (unpubl. Ph D. dissertation ed.). Univ. Of Queensland, Brisbane, Australia. Wikimedia Commons has media related to Oxudercinae. This page was last changed on 11 March 2019, at 08:40.